I've been busy making a number of stitch markers so I can practice making wrapped loops. I still have a long way to go but I'm getting better and faster. 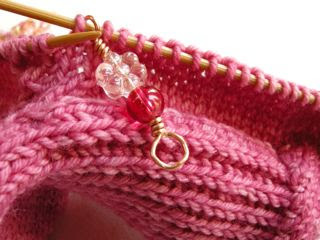 This particular stitch marker is for those two row repeats, such as a decrease round alternating with a knit round, as in sock gussets, shown above. 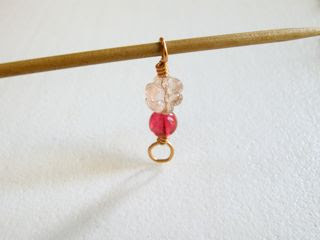 The fancy flower bead at the top, indicates to me, that I should do 'something' in that round (decrease stitches). When I come to the marker again, I simply reverse the marker, turning it upside down, so that now, the plain bead indicates that nothing needs to be done for that round. We'll see how it works. I used red and green DULL plastic ones looped together. To my mind red means STOP and decrease and green means GO knit a plain round but yours is much prettier!